This one of a kind new model Rocket watch from Rougois combines quality materials and unique design that are constantly produced by this innovative watch maker. Features the seconds counter on the left, & hour counter on top center. Why buy your from BillyTheTree? We are an AUTHORIZED Rougois Watches DEALER! 100% genuine! 100% new! Beware of fakes and seconds! Full manufacturer's warranty included with EVERY ! Questions? Email us today to connect with a expert. You can also scroll down for more info! This one of a kind new model Rocket watch from Rougois combines quality materials and unique design that are constantly produced by this innovative watch maker. Features the seconds counter on the left, hour counter on top center and minutes counter on the right. 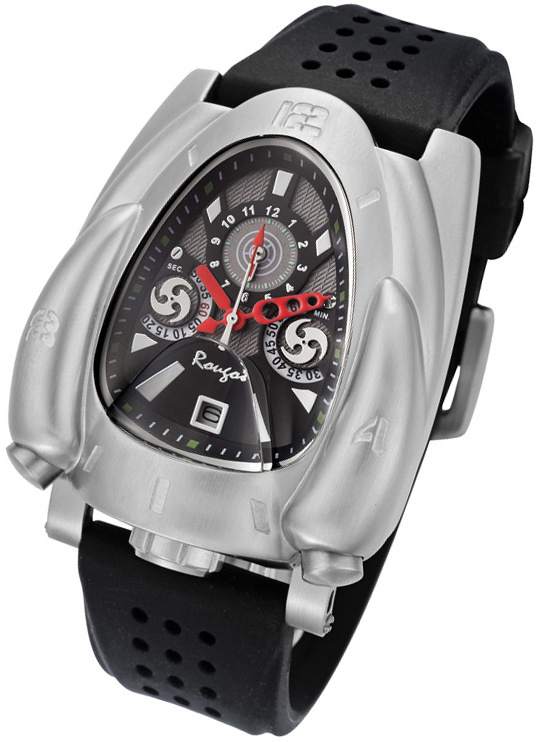 This rocket watch is suitable for many occasions, being extremely comfortable for daily use. Please note that certain values, including length, weight may vary for items that are available in different sizes. A length of "0" above indicates that this item can be custom-sized, or that different sizes are available. Values are subject to change, and should be viewed as a general reference only. We want you to be thrilled with both the service and the products you receive when you shop with us at BillyTheTree Jewelry. That's why we are proud to offer you a 30-day 100% money-back guarantee! If you're not happy with an item you purchased from BillyTheTree Jewelry, then we will credit you 100% of the product cost once you've returned it to us, within 30 days of receipt of your item. - This satisfaction guarantee is in addition to any manufacturer's warranties that may exist for a given product; in other words, 30 days is the minimum time you'll have -- see individual product descriptions for details on any extended warranties that may exist. - Personalized items, including, but not limited to, medical ID bracelets and engraved jewelry are not covered by this guarantee. - The product must be returned unused and in the original condition you received it in, with all original packaging and no signs of wear. Sorry, used products are not eligible for refund. - Any shipping costs you paid (for expedited shipping, insurance, etc.) are non-refundable. - We are not responsible for shipping damages or lost packages on return shipping; we recommend you ship using a padded envelope and that you obtain a tracking number. - Please allow for 1-2 weeks once the item has been received by us in order for the credit to show up in your account. - For safety reasons, food/supplement products cannot be exchanged or returned, unless noted otherwise. - When returning an item for refund that came with a free gift, the gift's value will be deducted from the total refund if the free gift is not also returned. - Wholesale customers, please note the following: "sales are final. You have a 5 day inspection period starting the date of delivery, and you may return any broken/damaged items within this period. We will not accept returns on wholesale items after this period has passed, or once any item has been resold." Please contact us if you have any questions about our return policy. Please also see our full list of policies.